The Lord Jesus is the most wonderful Person in all the universe! He is different from any person who has ever lived. His coming into the world was different from ours. He never committed a single sin. He claimed to be God. He did things which only God can do. Yes, He is! Seven hundred years before Jesus was born, the prophet Isaiah wrote of Him, "For unto us a child is born, unto us a Son is given…and His name shall be called…The mighty God…" (Isaiah 9:6). God has been here on the earth! Jesus Christ, God the Son, was here! The apostle Paul said, "…great is the mystery of godliness: God was manifest [seen] in the flesh…" (1 Timothy 3:16). One of the amazing things about God is that He loves sinners. He loves us so much that He sent His Son into the world to save us from our sins. 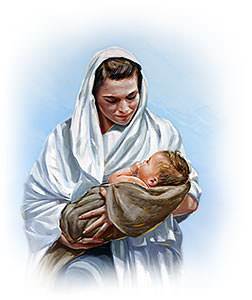 The Bible says, "…the Father sent the Son to be the Savior of the world" (1 John 4:14). There is another reason why God sent His Son into the world—God wanted us to know what He is like. People have many wrong ideas about God. How could God show us what He is really like? There was only one way—God had to become a man and live on the earth among people. That is exactly what happened! The Lord Jesus is God the Son. He came into the human race as a tiny baby, and He lived among the people for 33 years. The Bible says, "No man has seen God at any time; the only begotten Son…has declared Him [shown us what God is like]" (John 1:18). Jesus was truly a man; yet He was truly God. He showed that He was God by doing things which only God can do. On one occasion Jesus was with His disciples in a small boat. Jesus was tired, and He fell asleep in the boat. While Jesus was sleeping, a terrible storm arose. 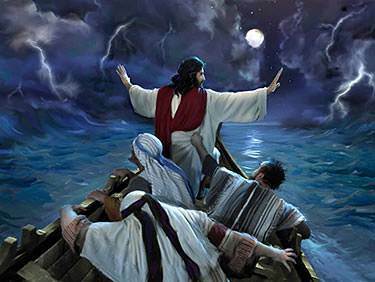 The disciples thought that the wind and waves would sink the little boat. They were terrified, so they woke Jesus saying, "Lord, save us!" Jesus stood up and spoke to the wind and the waves saying, "Be still!" Immediately the wind stopped blowing and the sea became calm. The disciples were amazed. They said, "What manner of man is this, that even the winds and the sea obey Him!" (Matthew 8:27). Jesus taught us that God is kind and good, and that He has love and compassion for people when they are sorrowful and overcome with grief. One time a funeral procession passed by Jesus. All the people were crying. The only son of a widow had died, and they were on the way to bury him. This poor woman had no husband to care for her, and her only son had just died. She was crying her heart out. 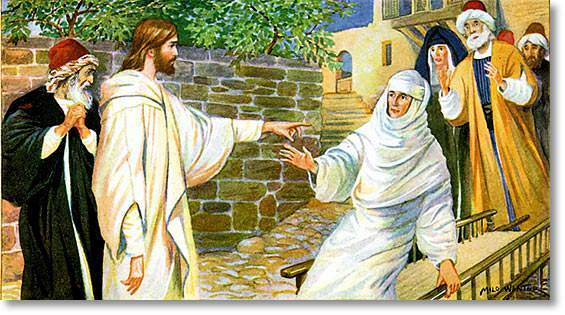 Jesus had pity on her and told her not to cry. Then He spoke to her son who was dead and said to him, "Young man, I say to you, Arise!" These people realized that only God could give life to a dead person. That is why they said, "God has visited His people." The Bible tells us that Jesus raised, not just one person, but three people from the dead! Have you ever wondered what God is like? He is just like Jesus! 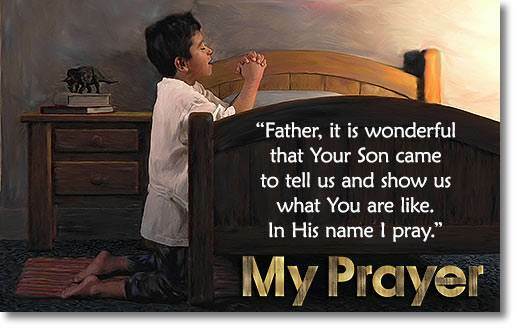 Jesus said, "I and My Father are one" and "He who has seen Me has seen the Father" (John 10:30, 14:9). 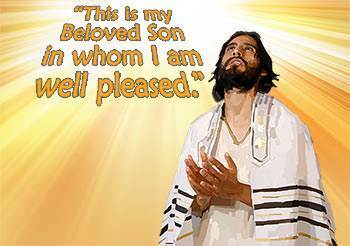 Jesus, as a man, did His Father's will perfectly. He showed people what God is really like. God was so pleased with His Son Jesus that He spoke from Heaven saying, "This is My beloved Son, in whom I am well pleased" (Matthew 3:17). God knows all about our sins, but He loves us so much that He cannot bear to lose us forever. The Bible says that God is "not willing that any should perish [be lost forever]…" (2 Peter 3:9). "He came unto His own [people, the Jews] and His own received Him not. 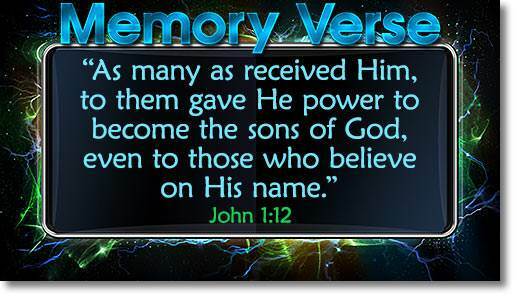 But as many as received Him, to them gave He power to become the sons of God, even to those who believe on His name" (John 1:11-12). Ken and Amy watched a long line of ants crawling across a sidewalk to an old piece of cake lying in the street. They were amazed at how busy the ants were. Suddenly they heard a truck. 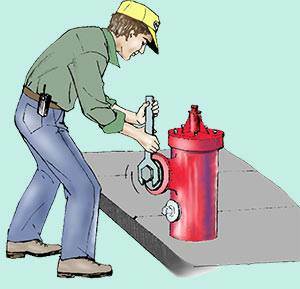 They watched as the driver got out and began to turn on the water hydrant at the corner. They knew that water would soon be rushing down the street taking everything with it. Amy screamed, "Ken, all the ants will be drowned! How can we help them?" 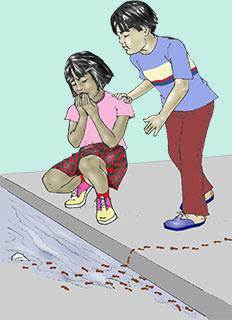 She cried out to the ants, "Get out of the way or you will be drowned!" But the stream of water came rushing down and the ants were drowned. Amy began to cry. They ran to mother and told her how the ants drowned. "I tried to tell them to get out of the way," cried Amy, "but they would not listen." Mother explained why they did not listen. "Amy, you are a person—a human being. Ants are different from us. They could not understand what you were saying. The only way they could understand would be for you to become an ant, and you could not do this. "But God loved us, He sent His Son into the world to live among us so we could know what God is really like." God has been here on the earth. Jesus said, "He that has seen Me has seen the Father." (John 14:9). God loves sinners! He is not willing that any should be lost. Maria encourages Susan to tell her Mother about the Christian camp. Steven has exciting news about his friend Randy. Maria was impatient to hear the news about Randy, and Steven told her excitedly, "This afternoon, Randy told all the guys at school that we were Christian brothers, because he had also received Jesus as his Savior." "Wow!" Maria responded. "Did the other guys laugh?" "A few did. I think some of them were uneasy and didn't know what to say. But also, Randy asked me if I would go to Camp Good Hope with him this summer. The camp contest is just in your class and the winners will go free, but anyone can go if they pay. I am going to ask Dad tonight if I can go. What do you think?" "Wow! Steven, I can't imagine a more wonderful summer than all of us going to camp together," Maria said excitedly. "I have always wanted to go to camp during the summer and now we both have a chance to go," Steven replied. "I think we should pray about this, Maria." Steven and Maria sat down on the porch step and prayed. That night, when supper was over, Steven waited for his chance to talk to his father and followed him outside. While Maria helped her mother with the dishes, she quietly prayed again for both Steven and Susan. Maria knew that part of her prayer was answered when Steven came into the kitchen with a big smile on his face. He told her that Dad would pay his camp fee, but he would have to earn his own spending money. Maria realized she would need some spending money too. She and Steven decided they would ask the neighbors for chores to do after school to earn some money. Maria could hardly wait to see Susan the next day. Susan said sadly, "Mother said I could not go to camp even if I win, because we cannot afford to buy the clothes I would need." Maria would not give up. She said, "I have clothes from last summer that are too small for me, Susan. I will ask my Mom if you could have them. You are smaller than I am, so I think they will fit you. Also, you can earn some spending money with after-school jobs like we do. Keep praying, Susan. I just know that Jesus will somehow let us go to camp together." Susan and Maria continued to work hard during the final weeks of school and Miss Wilson praised their efforts. The winners of the camp contest were going to be announced on the last day. They were both excited and looked forward to the final days of school. Linda Sooter, who sat behind Maria, became very jealous of the attention Maria and Susan were receiving. She began to tease Maria when the teacher was not looking. Maria did not like the angry feelings she had towards Linda. "Maria, you should tell Miss Wilson about Linda," Susan said with anger in her voice. 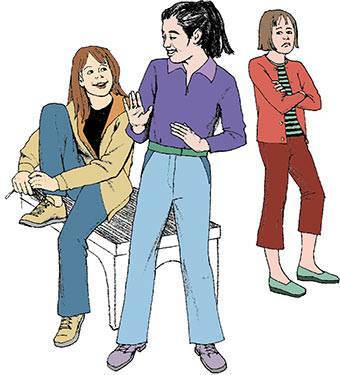 "I know," Maria replied, "but I do not want to be a tattletale. Linda is smart and could be a winner too. I don't think she knows Jesus, so she needs to go to camp to hear about Him. School is almost over and then she will not tease me anymore." The last week of the school year finally arrived. All those in Maria's class were eagerly awaiting the announcement of the winners going to camp during the summer. When the moment came, the room became very still as Miss Wilson took a folded piece of paper from her desk. Maria felt a tight knot curl up in her stomach as Miss Wilson began to speak. "I want to congratulate every one of you in the class this year," she said. "Most of you have improved in your work and also your conduct. I wish I could give more of you tickets to camp, but I have only five tickets to give away. If you are not one of the five winners but would like information about the camp, I have registration forms on my desk. Anyone is welcome to take them home. "Here are the winners of the camp contest. 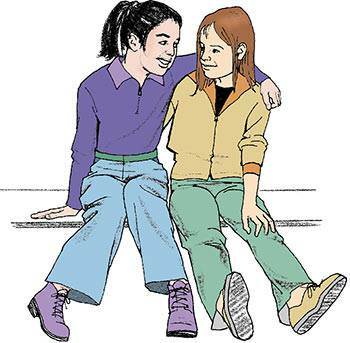 Please stand up as I read your name: Jim Ferguson, Susan Blake, Paul Burton, Linda Sooter, and Maria Ortega." As Miss Wilson called her name, Maria felt glued to her seat. The room was swimming before her eyes. She was so happy! "Maria, are you going to stand up?" the teacher asked. "Oh, Miss Wilson, I was so excited, I forgot to stand up," she answered. As Maria stood up, laughing at herself, the rest of the class began to laugh, too. Then Miss Wilson said to the class, "I want to congratulate our camp winners. I hope all of you appreciate what my friends have done to give me these tickets. I look forward to a good report from each of you when camp is over." When the class was dismissed, many classmates crowded around the winners to congratulate them. They laughed as they teased the winners about bugs and wild animals in the bushes. Everyone was excited, except Linda Sooter. She gave Maria and Susan an angry stare and then ran off with her friend Amy. Maria and Susan left the school. They were so thankful that both of them were winners. But Maria said she was concerned about Linda being at camp with them. "Don't worry," Susan assured her. "Linda won too! She has no reason to be jealous now. She worked hard and deserves to go. Things will be fine once we get to camp." Then Susan changed the subject, "Maria, do you really think my mother will let me go to camp?" Will Susan's mother let her go to camp? See what happens in the next exciting lesson.